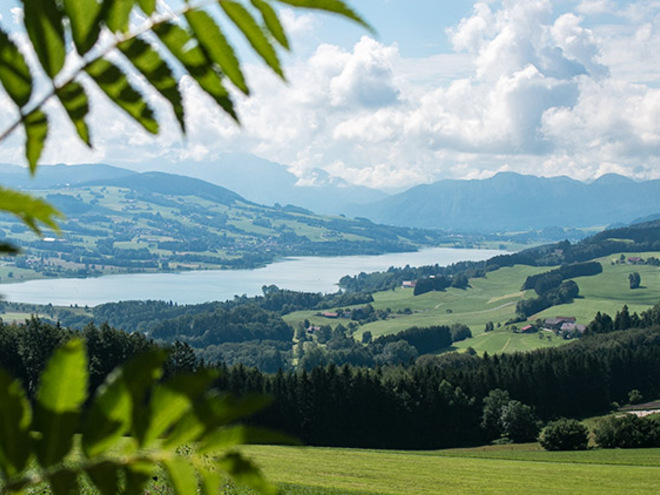 To the north of the Mondsee you can find the romantic Irrsee lake. This moor lake is 5 km long and 1 km wide and is surrounded by a natural and unspoilt landscape. Due to its unique fauna and flora the whole lake is protected by nature protection laws. Bathers enjoy its warm temperatures while anglers appreciate its good stock of fish. As legend goes, the area now covered by the Irrsee was once a fertile farmland. Once the castle of an evil and crafty sorcerer stood upon a hill here. He tormented all of his diligent neighbours with his pranks. One day he sent a messenger to give the brave salt miners of Bad Ischl a sealed pot. They were suspicious enough to refuse the gift and so the messenger took it back. On the way back to the castle he took a break an opened the pot himself out of curiosity. Masses of water flowed out and flooded the whole area sinking the castle. The water formed the Irrsee lake and some days the towers of the castle can still be seen at the bottom of the lake. 1. The presented swimming locations and access sites to bodies of water are to be considered free suggestions and serve exclusively as non-binding information. We do not intend to enter a contract with the users of this website. Using the data does not conclude a contract with us. The data must only be used for private use; any commercial use is forbidden. In particular, it is prohibited to offer the data on commercially operated websites, file-sharing platforms, etc. or to utilize it for the development of commercial products. The download does not provide the user with any rights to the respective data. The information we have posted in the section 'Sports and leisure - swimming waters' was gathered with the utmost care. Nonetheless, we do not assume any liability regarding correctness and completeness of the information. The information posted in the section 'Sports and leisure - swimming waters' was not posted by us but by third parties (§ 16 E-Commerce Act (ECG)). We do not have any influence on whether the information provided there (such as entry points, depth, hazardous areas, currents, temperatures, water quality, etc.) is authentic, correct, or complete. We do not examine these foreign contents. For this reason, we do not assume any liability regarding the authenticity, correctness, or completeness of the information. Construction measures and other influences can result in a temporary or permanent obstruction or shutdown of the swimming location or access site to the body of water. In this case, their utilisation might be restricted or impossible. The use of the data as well as the use of the swimming locations and the bodies of waters occur at the user’s own risk on his/her own responsibility. The user is, in particular, responsible himself/herself for complying with the regulations (e.g. swimming bans, jumping into the water in designated areas only, avoiding pollution, bans on open fires, etc. ), assessing his/her own personal capabilities, assessing risks, orientation, etc. We exclude any kind of liability for any damage, particularly for any accidents. 2. We are not responsible for the contents of external websites; in particular, we do not assume any liability for their statements or contents. Furthermore, we do not influence the design or contents of websites that can be accessed from mondsee.salzkammergut.at via hyperlinks or that use hyperlinks to refer to mondsee.salzkammergut.at. The websites that can be accessed from mondsee.salzkammergut.at via hyperlinks or that use hyperlinks to refer to mondsee.salzkammergut.at are not regularly monitored. Furthermore, we do not assume any claims to the websites that can be accessed from mondsee.salzkammergut.at via hyperlinks or that use hyperlinks to refer to mondsee.salzkammergut.at. 1. Each of your recommendations regarding a swimming location or an access site to a body of water or any other details or information is free of charge. Neither do we assume any liability for your recommendations and, in particular, the correctness of the information nor are we liable for any kind of consequence that is a result of the use of your suggestion by a third party (particularly by users of this website). At no time will we check the suggestions or any other details or information you have posted. We do not intend to enter a contract with those who post suggestions or any other details and information on this website. Posting any data (information) does not conclude a contract with us. With the recommendation of a suggestion, you are assuming special responsibility towards other users. Please take this responsibility seriously and describe your suggestion with the utmost care to the best of your knowledge and belief. 3. By posting the recommendation of a suggestion, you are instructing us with saving your suggestion and the details provided by you on our website, and with granting permanent access to third parties, particularly to users of this website. We reserve the right to partly or completely block or delete the suggestions and other details or information you have posted anytime without giving any reason. This shall not give rise to any kind of claim on your part. 4. We are not responsible for the contents of external websites; in particular, we do not assume any liability for their statements or contents. Furthermore, we do not influence the design or contents of websites that can be accessed from mondsee.salzkammergut.at via hyperlinks or that use hyperlinks to refer to mondsee.salzkammergut.at. The websites that can be accessed from mondsee.salzkammergut.at via hyperlinks or that use hyperlinks to refer to mondsee.salzkammergut.at are not regularly monitored. Furthermore, we do not assume any claims to the websites that can be accessed from mondsee.salzkammergut.at via hyperlinks or that use hyperlinks to refer to mondsee.salzkammergut.at.